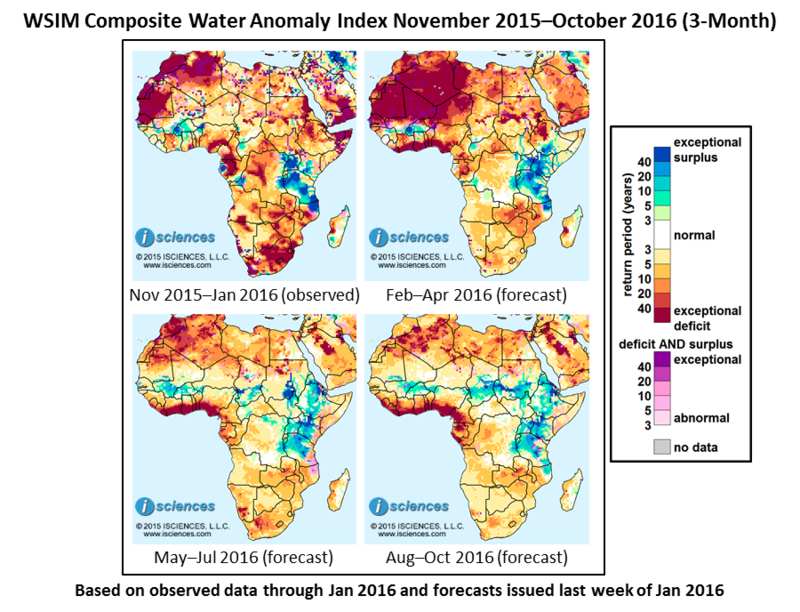 Water deficits are forecast to dominate Northwest Africa, coastal West Africa and southern Africa through October 2016 (first map below). Exceptional surpluses are expected in East Africa, particularly in Uganda, Kenya and Tanzania. Surpluses are forecast to emerge in Ethiopia, Sudan, and the Sahel during the latter portion of the forecast period. The drought, along with wars, in Africa has undermined economic growth and called further attention to the fragility of African governments. By some estimates more than 40 million people in twelve countries are in need of humanitarian assistance due to food shortages. The UN warns that Ethiopia is suffering its worst drought in 30 years. Zimbabwe followed other African nations in declaring a state of emergency, as a fifth of its population faces chronic food shortages, 16,000 cattle have died, and 70% of crops in the south have been abandoned. Low water levels in Lake Kariba, which straddles Zambia and Zimbabwe, have reduced power generation in both countries. Flooding in northern Malawi spurred an unusual request for aid: condoms to prevent the spread of HIV/AIDS in the refugee camps. The 3-month composites (below) illustrate the evolution of water anomalies in greater detail. Exceptional deficits in northwest Ethiopia are forecast to persist through May and then transition to surpluses. Deficits in southern Africa are forecast to persist through the remainder of the forecast period. However, the extent of exceptional deficits in the south will be confined to smaller pockets than in recent months with greatest extent forecast in February, covering much of Zambia and Zimbabwe. Surpluses are forecast to continue to emerge in southern Mali and Burkina Faso, persisting through October and emerging eastward across the Sahel in southern Chad and Sudan July through October. Surpluses are also forecast along the White Nile February through October.